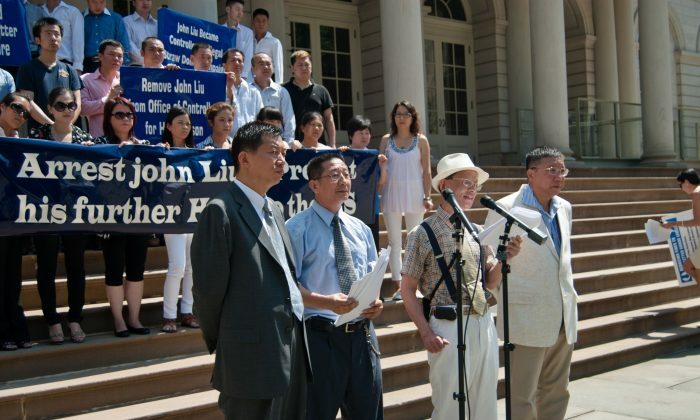 NEW YORK—Lu Dong completely opposes City Comptroller John Liu’s run for New York City mayor. It is not so much Liu’s policies, nor the fact that two of Liu’s staff were found guilty of attempting to use straw donors to defraud the city of campaign matching funds. He is against John Liu because of the people in the Chinese community driving his campaign behind the scenes—people in the United States who are beholden to the Chinese regime, as Lu once was. Lu was one of three leaders in New York of the Chinese regime’s strategy to influence and infiltrate the United States. He and the others were assigned to be on the front lines of recruiting Chinese businesses and nonprofits under the Chinese Communist Party (CCP) flag, with the purpose of influencing local politics and promoting the interests of the CCP abroad. After renouncing his position with the regime, Lu has now made it a life goal to expose the filth of the system. He walked away from the perks granted to allies of the CCP. Now he receives death threats for speaking out, both individually, and as the spokesman for the New York-based The Christian Democracy Party of China. In 1989, Lu joined with thousands of students in Tiananmen Square who believed the CCP could reform and open up to the outside. Yet that hope was crushed under the treads of tanks, and the boots of soldiers acting under orders to silence the peaceful protest. Lu, a public school teacher, fled China after the massacre to start a new life in the United States. He received his master’s degree from Hunter College in New York and in 2002 became a U.S. citizen. Lu established an association for graduate students to help the Chinese do business with the United States. “We were under the delusion that we could do business first, then democracy would follow,” said Lu, adding that his role as a leader of the Tiananmen protests gave him a level of fame and influence among Chinese living in the United States. Lu’s timing was right. President George H. W. Bush had recently passed the Chinese Student Protection Act of 1992 to help Chinese dissidents escape persecution. This built on Executive Order 12711, passed in 1990, which made it easier for Chinese students to get green cards. Thus, when Lu put an advertisement for his association, the Chinese Students and Scholars Association (name translated from Chinese), in the Chinese newspapers, “Everyone came,” he said. Yet the popularity of his association also drew the attention of the Chinese regime and its foreign agents. “They wanted to win the favor of the Chinese graduates,” Lu said. The Chinese Communist Party already had a particular interest in business associations at the time. According to the book, “Associations and the Chinese State: Contested Spaces,” by Jonathan Unger, the CCP was trying to establish business associations to work as “bridges and links” between the regime and civil society. Lu said he was brought closer through a series of requests, then offered incentives as he continued to work with them. The first favor he was asked for by the regime was to help get the Clinton administration to renew China’s most-favored-nation trading status in 1993. Lu organized 20 people and set up a booth in Flushing, Queens, to collect signatures. He then brought the signatures while lobbying the Office of the United States Trade Representative. His effect on the Chinese community and public opinion, in general, was exactly what the Chinese regime wanted at the time—particularly after the massacre. China’s ability to renew its trading status was hanging on whether Chinese negotiators could convince U.S. officials the country was making progress on human rights. China was also trying to win the support of Chinese people abroad who had turned their backs on the regime. The 1997 meeting was the first of the Chinese Overseas Friendship Association, held through the United Front Bureau. The United Front is the Chinese regime’s network of offices under the Central Committee of the CCP, which leads its efforts to win support from Chinese associations, nonprofits, and influentials around the world. Lu said its purpose is to create a front line of Chinese to act in the interests of the regime. He reached into his desk again and removed an engraved plaque given to him for the occasion by Wang Zhaoguo, who only recently retired as vice president of the Chinese regime’s National People’s Congress Standing Committee, which consists of 150 top CCP members. Lu came to know the agents of the United Front on a personal level, and the details of its operations. Gradually Lu became one of the three leaders of this system in New York. “They used me to influence public opinion,” Lu said, noting that his role was to speak to the Chinese people who were in the middle—not the communist hard-liners or the dissidents. “Fundamentally, they wanted to use me for their power, to influence Chinese overseas,” Lu said. On Sept. 11, 2001, Lu was in Shanghai watching TV when the terrorist attack on the World Trade Center happened in New York. As an American citizen, Lu took it personally. “It was a massacre, a terrorist attack … and high ranking [Chinese] officials were gloating,” Lu said. “That is when I realized they were not my friends,” Lu said. The second Chinese Overseas Friendship Association meeting was held in China a month after the attacks. Lu said at that meeting the president of the New York branch of the United Front, Huajun Xiong, “was very happy about the attacks.” He had taken photos of the devastation in New York City and was enthusiastically showing everyone. At that point, Lu decided to break his ties from the regime. He renounced his position, and defected. He now sees it as his duty to expose the CCP and its leading agents overseas, particularly in New York. “I know all of them,” he said.